« Terrorism fuels a Dangerous Plan to Split Pakistan from USA. Pakistan Christian “Burnt”, Wife “Raped”, For Refusing Islam. The Christian Man died later. 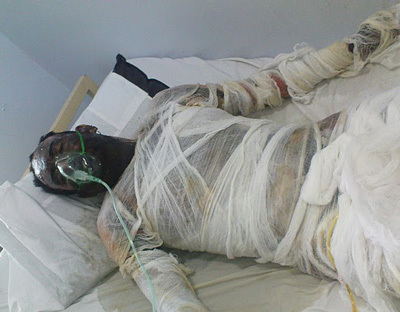 RAWALPINDI, PAKISTAN (BosNewsLife)– A Christian man was fighting for his life in Pakistan’s Punjab province Saturday, March 20, after Muslim leaders backed by police burnt him alive for refusing to convert to Islam, while his wife was raped by police officers, Christian and hospital sources familiar with the case told BosNewsLife. 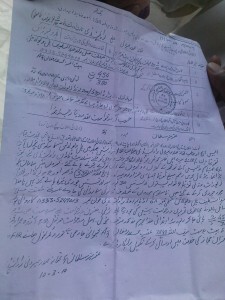 Arshed Masih was burnt Friday, March 19, in front of a police station in the city of Rawalpindi near Pakistan’s capital Islamabad, following apparent death threats from his Muslim employer Sheikh Mohammad Sultan, an influential businessman, and religious leaders, said the Rawalpindi Holy Family Hospital. His wife, Martha Arshed, was allegedly raped by police officers. Their three children — ranging in age from 7 to 12– were reportedly forced to witness the attacks against their parents. “Both [Masih] and wife were rushed to the Holy Family Hospital and are under treatment,” the hospital said. He was listed in serious condition with about 80 percent of his body burnt. The couple apparently lived with their children in the servant quarters of Sultan’s estate in Rawalpindi, a key trade and tourist destination. In January, religious leaders and Sultan allegedly asked Arshed to convert to Islam with his whole family. After he refused, the group reportedly threatened him with “dire consequences”. Arshed offered to quit his job, but the businessman allegedly said he would “kill” him if he were to leave. However, “Arshed refused to convert and stood firm in his faith. Arshed`s wife was raped by the police and he was burnt alive,” Friday, March 19, local Christians said, speaking on condition of anonimity. The case comes at a time when church groups have complained about growing attacks against minority Christians by Muslim militants, often with the alleged support by local law enforcement officials and other authorities. (BosNewsLife Asia Service includes BosNewsLife correspondents often working in difficult circumstances. In some cases, including this report, their names are not mentioned due to security concerns. With editing by BosNewsLife’s Stefan J. Bos). A True Sing of Islamic Peace… Arshed Masih burnt alive, died later. Amen. 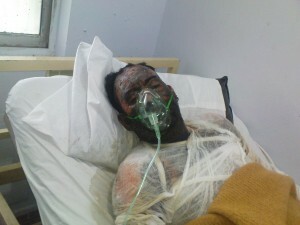 Arshed Masih, a 38 year-old Pakistani Christian, died yesterday (22.03.10) evening at 7.45 from his very serious injuries. The family requests that an autopsy is performed before the funeral. Christian associations and human rights activists demonstrate outside the hospital. Catholic leaders: the federal and provincial government do not punish the guilty. Read here details………. Courtesy : BosNewsLife‘s Stefan J. Bos, AsianNews.it & The Religion of Peace. This entry was posted on March 22, 2010 at 10:19 am and is filed under Al Jihad, Alertpak, Christians in Pakistan, Lashker e Taiba, Minorities under attack in Pakistan, Pak Terrorism, Persecuted Pakistan Women, Persecution upon Minorities in Pakistan, Terrorism. You can follow any responses to this entry through the RSS 2.0 feed. You can leave a response, or trackback from your own site. So sad! What wrong with reglion and this world !